Monster Atlantic is a rock music experiment that hails from the heart of Roanoke Virginia. 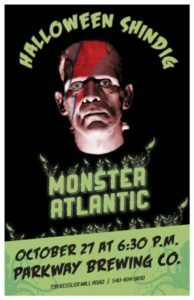 Monster Atlantic delivers a high energy rock show full of collaborative original music fueled by the combination of singer/rhythm guitarist Lance Smith, lead guitarist Matt Stump, bassist Jason Davis and drummer/backing vocalist Tad Dickens. The band has opened recent shows for Big Head Todd and the Monsters, Carbon Leaf and Allen Thompson Band.